In September 2014, Tim and I decided to go sugar-free for a month. We cut out refined sugar, fake sugar, and white flour for 28 days. It was a great experience and we have since been living a selectively sugar-free (because we will still eat white flour and refined sugar sometimes…) lifestyle ever since. If you’re curious about cutting back on your sugar consumption or you’ve already begun to live a sugar-free lifestyle, this is the place for you. You’ll find recipes, resources, and inspiration for wherever you are on your sugar-free journey. Have fun exploring and feel free to share your your experiences or ask questions in the comments or email me at emgardner8@gmail.com! The 5 W’s (and and H) behind No Sugar September: Get the backstory and specifics of our decision to go sugar-free for a month. A No Sugar September Update: Thoughts after two weeks of the sugar-free life. Emily’s Favorite Resources: A list of my favorite resources for sugar-free recipes and inspiration. A Month of Meals: The low down skinny about what we ate during No Sugar September. We went over our food budget during No Sugar September. There were several non-NSS contributors to the overage (like going on vacation at the beginning of the month), but it’s definitely an area I want to focus on as we continue this lifestyle. Buying many of our sugar-free staples in bulk is a way we did save money and will continue to save money. Here are the items we use on a daily basis that we get from Costco. Half & Half – I used to drink my coffee black, but after having James, I switched my tune. Both Tim and I drink our coffee with half & half. Cottage Cheese – A big tub of high quality cottage cheese for under 5 bucks is quite the steal. Especially when it’s a key ingredient in several NSS favorites (chile egg puff, caprese egg puff, and cinnamon power pancakes) and is a great snack. Eggs – Also a key component in the egg puffs and various baked goods. A fantastic breakfast or snack (hardboiled). Vanilla – If you’re not going to make your own vanilla extract, this is a phenomenal deal (even if it does have trace amounts of sugar). Old Fashioned Oats – Between granola, oat bars, and oatmeal, oats are a hot commodity in our household. Cinnamon – If you don’t have a WinCo around, get your oft used spices at Costco. Greens – I’m never able to eat Costco greens quick enough to buy them, BUT if you like greens in your smoothies or eat salad often, Costco is you friend. Natural Peanut Butter – Kirkland brand is my current favorite peanut butter. I will cut my gushing short by saying it. is. awesome. Honey – When honey is one of your only sweeteners, you buy it in bulk. Maple Syrup – We’re lucky enough to have friends who make their own maple syrup, but if you don’t have a syrup hookup, Costco is the cheapest I’ve seen REAL maple syrup. Coffee – Tim and I drink too much coffee to buy fancy brands. Kirkland is good quality for the price. I love listening to podcasts. Here are a couple that touch on real food. Trina Holden on Inspired to Action podcast talking about simple steps to better nutrition. 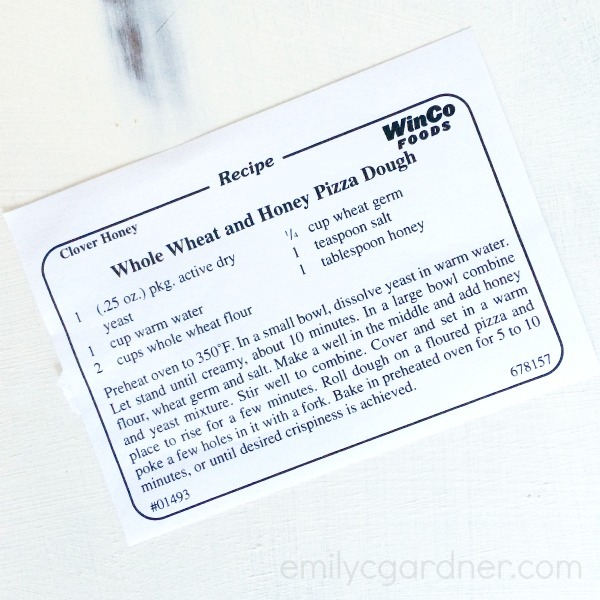 I’m not sold on this being the best honey whole wheat pizza crust, but it was good. The dough is a bit high maintenance and makes a soft, chewy crust. Bake your topped pizza for 20 minutes. I used flax meal instead of wheat germ. I can’t remember how I stumbled upon Jenny Barker‘s instagram feed, but I”m so glad I did! 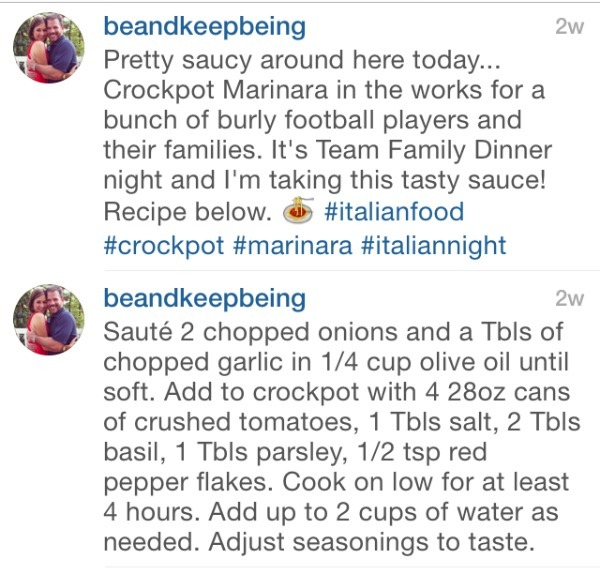 She had posted a photo (and recipe) of this crockpot marinara and I made it the next week. Just make sure the brand of crushed tomatoes you buy doesn’t have sugar. I used fresh basil, oregano, and left out the garlic. Makes a TON and I used it multiple ways.